This site is dedicated to helping parents find all the amazing, cool, once-in-a-lifetime events that you don't have to spend a fortune to take advantage of, but there are some events that are worth the splurge. A Night at the Museum Sleepover is one of them and would make a terrific Holiday Gift. 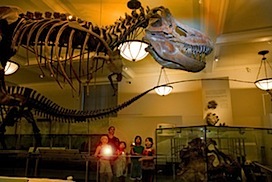 The American Museum of Natural History invites families to spend a night exploring the museum after everyone else has gone home and camp out in one of the exhibit halls. My daughter was lucky enough to be invited to do this with a friend who received the sleepover as a gift. What an amazing present! And they had such a great time. I recently wrote about how to find charity activities you can do with your kids. I like the fact that there are some organizations that make volunteering fun and feel not that different than any activity you might do with your children, but for a good cause. 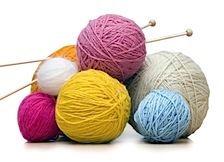 I just found out about one such event this weekend: A charity knit-off for teens and tweens. While everyone out there tries to remind us to keep on consuming to save the economy, I just don't buy it. In contrast, Obama's announcement of of his public works program on Saturday feels exciting. He is talking about about things like improving schools, providing universal broadband access and creating programs to increase energy efficiency. I can't help it, the guy makes me feel hopeful! Keep reading for more of this week's news including a simple test you can take to find out how your marriage will turn out, the toxic toy report and what in particular to avoid, my favorite family that clearly doesn't believe in birth control and more. Wow! This was a really fun and super popular giveaway event. We gave away over $2000 worth of prizes, my inbox is completely jammed with all of your entries and I've gotten lots of nice comments from your friends, who are happy to have learned about the site, so thank you for sharing it with them. And, welcome to our new readers. But here's what you really want to know... Who won! I asked and you delivered. Here are three more school fairs with rummage sales and other inexpensive shopping opportunities going on this weekend, in addition to the ones we already have in our events calendar. Also read below about another Brooklyn Holiday shopping event with free activities and discounts. Some last minute events, I thought were to good to skip. For some it's a traditional, for some it's a dream. Whether you've ever been to NYC's most famous Christmas show or not, you can win four free tickets to the show right here, today, on Mommy Poppins. 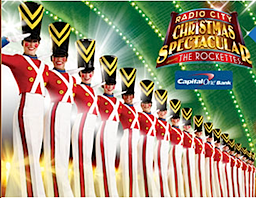 We're giving away a family pack of tickets to The Radio City Christmas Spectacular performance on Sunday, December 14 at 9am. Check out our other giveaways for Big Apple Circus Tickets, Wintuk Tickets and New York Shop Holiday shopping event. This is the third of five pairs of New York Shop tickets we are giving away. See the original post for more information about this event. My friend, Sara, and I were talking about how great it is to go to school fairs. I especially love them when they have rummage sales, which are great for picking up gently used clothing and toys. Our events calendar is back up (YAY!) and we've got some school fairs listed in there for this weekend. If your school is having a fair or other event please send me the info and we will post them on the site. We love school fairs! This weekend is also jam packed with craft and holiday fairs. If you missed our post earlier this week on the Craft Fairs, Sample Sales and other Holiday Shopping Events go check it out. These are awesome events. And of course we are still giving away lots of tickets to New York Shop, which is this weekend. Leave a comment on this post to win a pair of tickets. 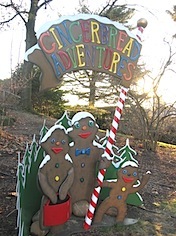 Erin, our new Bronx contributor, has posted a bunch of fun off the beaten track Holiday activities in the Bronx. Cool. And there's the free Milkshake Concert on Saturday that everyone is raving about. Oh and don't forget about all the Christmas Tree lightings and Santas, plus, in our Holiday Guide you'll also find lots of other holiday activities like visiting the Department Store Holiday Windows and Holiday Train Shows. Erin is the newest contributor to Mommy Poppins. She writes a blog about the Bronx, called BoogieDowner, and will be keeping us up to speed with all the great goings on in her borough. We have already given you the lowdown on the Holiday Train Show at the New York Botanical Garden up in the Bronx. Families travel from all over to check out the replicas of major New York landmarks made entirely out of plant parts. It's a truly magical exhibit that appeals to both the young and old. Another bonus? The Train Show is held in the snug warmth of the Enid A. Haupt Conservatory glasshouse, therefore it's a perfect holiday attraction no matter how cold it is outside. The only possible drawback to this amazing annual exhibit? The holiday crowds of course. So, if you're looking for an alternate plan to spend a festive day out and about in the Bronx with your family, you've come the right place. Read on for some attractions that are a nice back-up plan if the line for the Train Show is dampening your holiday spirit. What's more magical than the Cirque de Soleil? 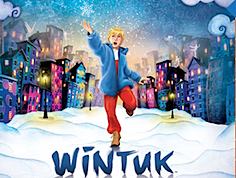 And what would make a better family Holiday outing than to go see Wintuk, the Cirque de Soleil's special Holiday family show? And what could possibly make going to see WIntuk better, but to have gotten your tickets for free? We're giving away 4 tickets to Wintuk for the Saturday, Dec. 20 performance at 11am. Wintuk runs through Jan, 4, 2008.